Suomy has revealed its greatest line-up yet, including an all-new range-topper, plus lids for Ducati and Aprilia. The Spec 1R takes over from the popular Gunwind as the No1 Suomy in 2002. It heralds a trend towards sleeker designs and, at 1200g, sets a new standard for light weight – Arai’s RX-7RR weighs 1440g. It also lacks the prominent vents so familiar on modern lids. Suomy claims this is because the Venturi air exit system is so efficient. The Spec 1R is £299 in plain colours and £349 in race replicas, £100 more than the Gunwinds. Unlike that model, it has a removable and washable lining and is lighter and quieter. 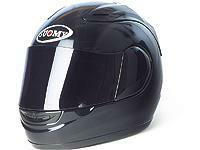 Tear-offs can also be fitted and the lid is ACU approved for racing. Colours are black, grey, silver and blue, with Biaggi and Jurgen van den Goorbergh replicas. Both Aprilia and Ducati chose the Gunwind shell to boast their logos. The £281 Aprilia designs are inspired by those seen on the lids of Troy Corser and Regis Laconi in WSB last season. The firm’s accessories boss, Massimo Granata, said: " We aim to give our superbike buyers the chance to have leathers and helmets to match the RSV. " He also revealed Aprilia will launch an updated set of one and two-piece Spyke leathers next year, which will both cost less than £600. Ducati’s Potere lid will arrive in February and cost £224. Multi-coloured, red/yellow or black designs will join Ducati’s £267 Scudetto helmet, which has been available this year.